Android System Recovery - How to Fix Android Stuck at Android System Recovery? Home > Resources > Recover Android > Android System Recovery - How to Fix Android Stuck at Android System Recovery? Have you ever seen "Android System Recover" on your Android screen when your phone can not be turned on normally? In this case, your phone will not give any response when you tap on the screen. How to fix it if you do not want to lose any data? 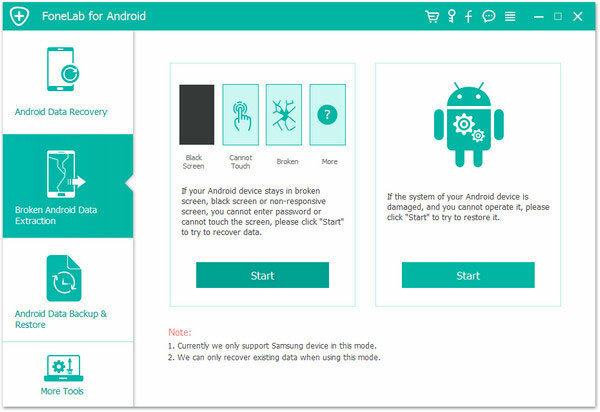 The topic today will give an effective tip to access Android recovery mode without data loss. Part 1. What Is Android System Recovery? Part 3. How to Get to Android Recovery Mode? Android System Recovery is a feature of each smart Android phone, with which you can make a system reset on your frozen phone. It is really helpful for you to restart the system, perform a factory reset and wipe cache partition when your touch screen can not work. At present, this is the best way to rescue your frozen Android phone. However, it may cause a great data loss. Before entering Android recovery mode, it is a good idea to restore Android files from your phone first. Broken Android Data Extraction is a professional software for data recovery from Android with broken and frozen screen. It really does a great favor to recover many types of files before performing Android recovery mode. It can rescue the data on your phone, like call logs, contacts, text messages, messages attachments, WhatsApp and its attachments, pictures, videos, music and other formats of files, from internal storage and SD card. With it, you can preview all the recoverable data and extract them to computer selectively. In the recovery process, the data on your phone will stay original without any data loss. 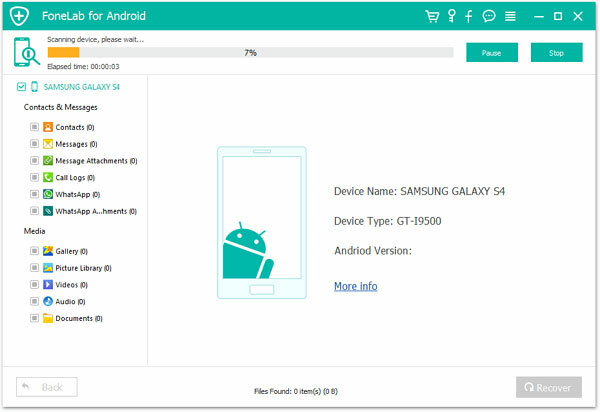 Please notice that the program only support Samsung Galaxy Note 5/ Note 4/ Note 3/ S6/ S5/ S4/ Tab Pro 10.1 at present. More technical supports for other Android devices will be developed soon. Step 1. Please download the free trial of Broken Android Data Extraction on your computer, here are two version for Windows/ Mac. Step 2. Install and launch Broken Android Data Extraction, connect your broken Android to computer via a USB cable. Two situations for you to start recovery. Step 3. Once your phone was detected successfully, please click "Broken Android Data Extraction", select your device name and device model from the drop-down menu, click "Confirm" to go on. Step 4. 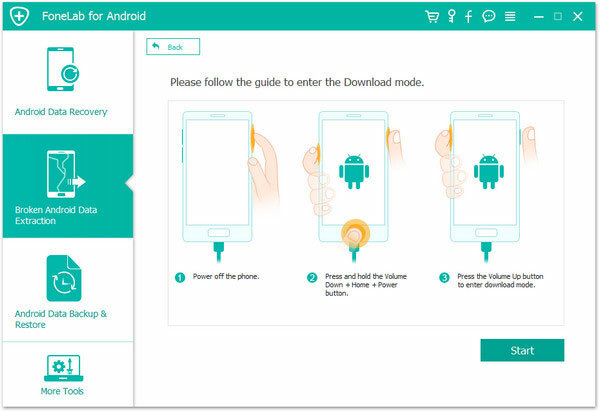 Please follow the interface prompts to enter the Download mode, click "Start" to access your Android phone. Step 5. The program will scan your whole phone to capture a listing of recoverable files on the interface as shown below. You can now select the data you want to extract from your frozen phone, click "Recover" button to export and save them readable on computer. After doing a backup with Broken Android Data Extraction, let us see how the Android recovery mode work. Check if the keys and buttons work first. To access the Android recovery mode, you must make sure that the Home key, the Volume keys and the Power key can work normally, or not, you can not get in Android System Recovery. You need backup your phone as quickly as you can, and send your phone to a professional repair shop. 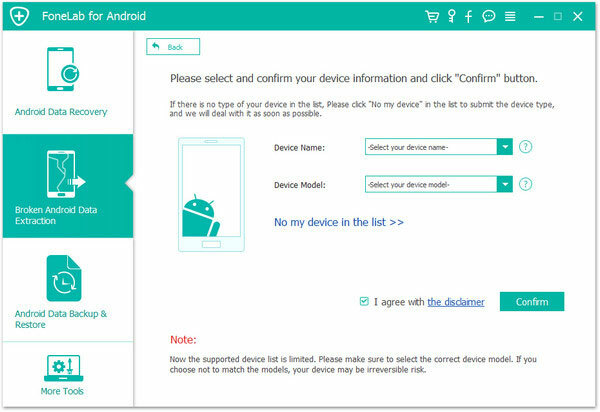 Please notice that not every device works in same steps, you can visit the manufacturer's website or do a quick search on Google. Step 1. Press Power key and tap on "Power off" from the screen. If your screen is unresponsive, please long press Power key for several seconds until the phone is turn off. Step 2. Press the Power key and Volume Down key, you can see a information listing of your phone as well as a "Start" on the top of the screen. Step 3. You can use Volume Up and Volume Down keys to pick a option from the menu, and press Power key to enter it. Now please press Volume Down key two or three times and you can see "Recovery mode" in red on the top of the screen. Press Power key to enter it. Step 4. The white Google logo will pop up followed by the Android logo as well as "No command" at the bottom of the screen. Step 5. Finally, press Power key and Volume Up key at the same time for around 3 seconds, then keep pressing Power key and hold down Volume Up key once, you can see Android system options pop up on the top of the screen. Use Volume keys to select a mode and press Power key to enter it. 1. Reboot system now: This option will restart your device normally. 2. Apply update from ADB: You can connect your device to computer and send commands to your device by ADB (Android Debugging Bridge). It is designed for developers and requires to install Android SDK (Software Development Kit). 3. Wipe data/ factory reset: This option will delete all the data including pictures, videos, music songs, contacts, call logs, messages and so on. It will bring your Android phone to the original factory settings and wipe the cache partition. If you want to trade your old phone, you can use it to remove all the Android data. 4. Wipe cache partition: Cache partition is the storage space for temporary system data, which mainly involves apps installations. You can wipe them without losing any personal data or settings. Wiping the cache partition can solve many Android issues without data loss, so it is recommended for common problems. Notice: You can wipe cache partition by going to "Settings" > "Storage" > "Cached data" on Google phones running Android 7.1 and higher.